FurReal Walkalots Lil’ Wags Kitty Only $7.99! Simply Adorable!! This would be a cute Easter Basket Gift Idea! Get this FurReal Walkalots Lil’ Wags Kitty for Only $7.99! (Reg. $12). Pet walkers wanted! What’s more fun than Walking a pet? Walking lots of them! Fur Real walk a lots pets feature a connectible system that lets kids walk one pet, Or their favorite pack! This cuddly Kitty comes with a short leash for tabletop walks and, as you push her, moves along with her signature bouncy walk and spring-activated tail motion. Lil’ wags leashes connect at the handle so kids can walk their pets together. (Each pet sold separately.) and there are all kinds of Lil’ wags pets – from puppies to a panda to a special binged-out Unicorn! 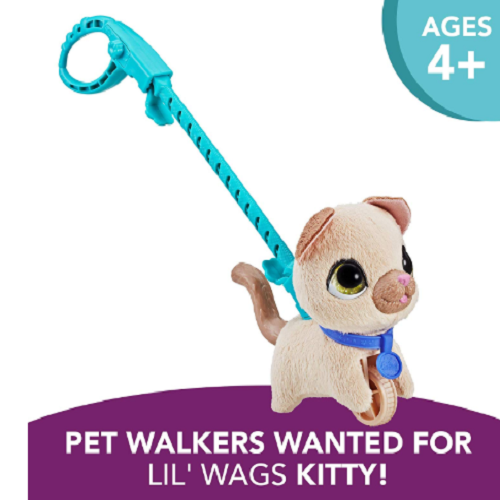 Also look for walk a lots big wags pets (sold separately), which come with a long leash and connector so kids can build their ultimate pack. Shall We take a stroll around the dining-room table? Sounds like fun!